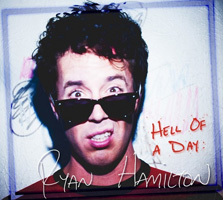 I first got a hold of the new Ryan Hamilton disc, Hell of a Day, a few three months back and enjoyed it immensely the first time I played it. There’s nothing earth shattering about these songs as they fit a basic powerpop template though, so I didn’t want to jump the gun, so to speak. I thought I’d let this record stir around in my head for a while and see if I felt the same way after repeated listens. Time usually tells. 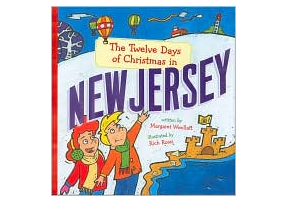 This disc is chock full of catchy memorable songs, starting with the opening “Be Kind, Rewind”. “Karaoki With No Crowd” has an infectious melody and sing-along chorus you won’t be able to resist. You WILL find yourself singing along to this one. In “4 Letter Verb”, Hamilton tries to understand how women communicate (give up Ryan, it’s no use), and in perhaps my favorite song on the disc, Hamilton expresses his frustration with one who refuses to communicate on “Respond to My Email”. “I Love You A lot” has a wonderful George Harrison-esque guitar part you’ll fall in love with. Other than a Rush cover that leaves me somewhat cold (Take It on the Run), there isn’t a misstep on the entire disc. Ten songs in all, Ryan Hamilton demonstrates the traits that make powerpop the most endearing genre of all. Each one is a short burst of back-to-basics pop that breaks each piece down into its most essential elements. Only the absolutely necessary remains, leaving each song as a 3 and a half minute start to finish hook. No fat, not a superfluous note. Hell of a Day is clearly more fun than any other disc I’ve heard in 2015 and may be the best of its kind. Time usually tells.